Are digital technologies making politics impossible? This question launched the Nine Dots Prize in October 2016, a new award for creative thinking in the social sciences that seeks to encourage innovative, interdisciplinary responses to the pressing issues of our time. 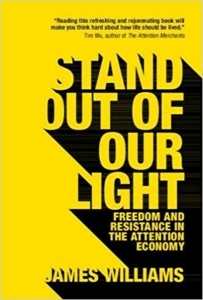 Chosen from over 700 applicants, James Williams was announced as the inaugural winner last year with his resulting book, Stand Out of Our Light: Freedom and Resistance in the Attention Economy, published on 31 May 2018 by Cambridge University Press in hard copy and open access formats. We spoke to James about the book and becoming the first recipient of the Nine Dots Prize. James Williams was undertaking PhD research at the Oxford University Internet Institute when a friend in the History department, Ernesto Oyarbide, mentioned the Nine Dots Prize and encouraged him to apply. Launched in October 2016, the Prize invited applicants to anonymously submit a 3,000-word essay in response to the question: ‘are digital technologies making politics impossible?’. With the winner awarded US $100,000 and the opportunity to develop their thoughts into a short book, Williams was announced as the first recipient of the Nine Dots Prize in May 2017. While Williams had over ten years of professional experience working at Google and was researching technology design ethics for his PhD, it was the provocative wording of the question that drew him to apply for the Prize. For Williams, there was something particularly interesting in the question’s implication that digital technologies are involved in an ongoing construction of our world and the reference to politics having become ‘impossible’ as a result – contrastingly implying a finality, a fixity to our current predicament. The ‘grammatical tension’ between these two visions seemed an apt mirror for the now-familiar friction between binary understandings of digital technologies as either offering the solutions to all our problems or as a detrimental, even outright destructive, force unleashed upon us. Rather than suggest that the truth simply lies somewhere in the middle, Williams sought to give voice precisely to the process of oscillating between these two perspectives as both a researcher and user of digital technologies – and perhaps, in so doing, finding something of a path forward. The resulting book, Stand Out of Our Light: Freedom and Resistance in the Attention Economy, turns its gaze upon the way that we engage with the emergent technologies at our fingertips. While much critical material has understandably focused on questions of information and its management, Williams instead argues that ‘in thinking about digital technologies, we haven’t given sufficient time to attention’. This perspective was partly inspired by a realisation that struck him when using such technologies: ‘I felt […] distracted. But it was more than just ‘‘distraction’’ – this was some new mode of deep distraction that I didn’t have words for’ (7). Rather than view lengthy scrolls down Facebook or Twitter feeds as benign detours from our central engagements with technology, he argues that these processes of ‘attentional capture and exploitation’ have come to define them, jeopardising our ability to achieve our intentions and goals: ‘One day I had an epiphany: there was more technology in my life than ever before, but it felt harder than ever to do the things I wanted to do’ (7). I knew this wasn’t just about me – my deep distractions, my frustrated goals. Because when most people in society use your product, you aren’t just designing users, you’re designing society. But if all of society were to become as distracted in this new deep way, as I was starting to feel, what would that mean? What would be the implications for our shared interests, our common purposes, our collective identities, our politics? (10). Without implying that all roads lead back to Donald Trump when it comes to considering the political crises of the moment, Williams convincingly argues that ‘consistently societal discussion has misread him by casting him in informational, rather than attentional, terms’ (58). Instead, he suggests that Trump’s now-infamous Twitter account functions ‘as an embodiment of clickbait’, showing how ‘content is incidental to effect’ in the present moment (58). It was this overtly political thrust to the book that marked a new form of thinking about technology ethics for Williams – ‘a new branch on the tree, so to speak’. While the book invites us to attend to the costs of this ‘attention economy’ and what we pay when we ‘pay attention’, it is nonetheless wary of advocating modes of disengagement and self-regulation that posit our online behaviours as akin to an ‘addiction’ requiring ‘detox’. Conflating what may feel compulsive and intermittently out of our control with ‘addiction’ can play into moralising discourses that imply the existence of contrastingly ‘pure’, ‘organic’ or ‘natural’ modes of engagement, but also, just as crucially, it puts the standard for change too high. In other words, there may be forms of user experience below that of ‘addiction’ that also require our focus and transformation. Indeed, while the aim of Stand Out of Our Light is to explore, rather than simply dissolve, the tensions between the destructive and generative potentials of digital technologies, Williams makes clear that it is through understanding and tracing complex networks of accountability that we might find a better means to make the needle actually shift and to instigate lawmakers, regulators, designers and others to pull the levers of change. In this sense, Stand Out of Out Light offers hope that we can ‘defend our freedom of attention’ and bring these new technologies back on to our side – after all, as Williams reminds us, ‘the web is fewer than 10,000 days old’ (124, emphasis in original). The book is striking in its particular blend of research, real-world examples and the anecdotal. Stand Out of Our Light is a text that intersperses insights from democracy theorists such as Jan-Werner Müller, technology journalists like Katharine Schwab and philosophers including Hegel and Karl Popper with references to Bon Dylan interviews and T.S Eliot’s The Waste Land, joined by evocative anecdotes of falling behind in high school calculus class due to a compulsion to play Tetris, amongst others. The inclusion of this personal voice was partly shaped by Williams’s experiences of working with and using technologies, yet he explains that this was also one of the key goals of the Prize – to reach a broad audience through something other than ‘a straightforwardly academic book’. Given that there was only a year between Williams being announced the winner of the Nine Dots Prize and the launch of Stand Out of Our Light, Williams describes the publication process as an expedited experience, with everything from writing to editing kicked up into high gear: ‘if doctoral work is like running a marathon, writing this book was like running a sprint at the end of the marathon.’ The result is a book that ‘covers a large terrain over a small number of pages’, akin to ‘casting a bunch of seeds’ with the aim being to see which, in time, may sprout into further research, with questions of future interest to Williams including the role of technologies as the new governors and governments of our time and the challenge of forging a new language for the politics of today. The interview gives the views of the author, and not the position of Democratic Audit. It was conducted by Dr Rosemary Deller, Managing Editor of the LSE Review of Books blog, and was first published on the LSE Review of Books blog. Is Twitter a populist paradise?